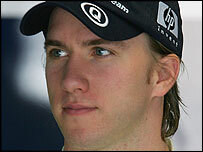 BMW have signed Nick Heidfeld to drive for their new F1 team on a three-year contract beginning in 2006. The 28-year-old German currently races for Williams, who will part company with BMW at the end of this season. The German manufacturer has bought the Sauber team, and Heidfeld is the new outfit's first driver signing. Heidfeld was set to be dropped by Williams who expect Jenson Button to join them for 2006, although the star is reluctant to leave BAR-Honda. BMW Motorsport Director Mario Theissen said: "We are very pleased that Nick will be with us in what will undoubtedly be a difficult initial phase. "He is not simply a fast and courageous driver, he is also an analytical and meticulous worker. "Nick already knows the two sites in Munich and (Sauber's Swiss HQ) Hinwil, and is familiar with everybody involved." Heidfeld, who is currently recovering from a broken shoulder suffered in a cycling accident: "I'm really looking forward to the future. "As far as I'm concerned, this represents the fulfilment of a big dream. "I've experienced at first hand (with Williams) the commitment and resources BMW puts into its F1 project. "I'm not expecting a miracle during the first season after a new start in 2006, but I'm confident that the new team will be successful in the long term." Heidfeld achieved his first F1 pole position in May at the Nürburgring, where he finished second, and took runner-up spot at Monaco. BMW announced in June would be running its own F1 team from 2006 after acquiring a majority holding in Sauber. It had been racing in F1 as partner of Williams since the 2000 season. Antonio Pizzonia will continue to stand in for Heidfeld in his home F1 Grand Prix in Brazil next week.